Hopefully McDonald’s has the staff and the stock prepared for this: After a bizarre one-day promotion in which it quickly ran out of one-day-only available Szechuan sauce, the brave franchise is trying again. Starting today, the Chicago Tribune’s RedEye reports, Szechuan sauce returns to McDonald’s. Try not to get too excited or storm a store or sell your dog to get a packet. Some people, like fictional Adult Swim cartoon character Rick of Rick And Morty, get seemingly fanatical when faced with the possibility of that beloved sauce. 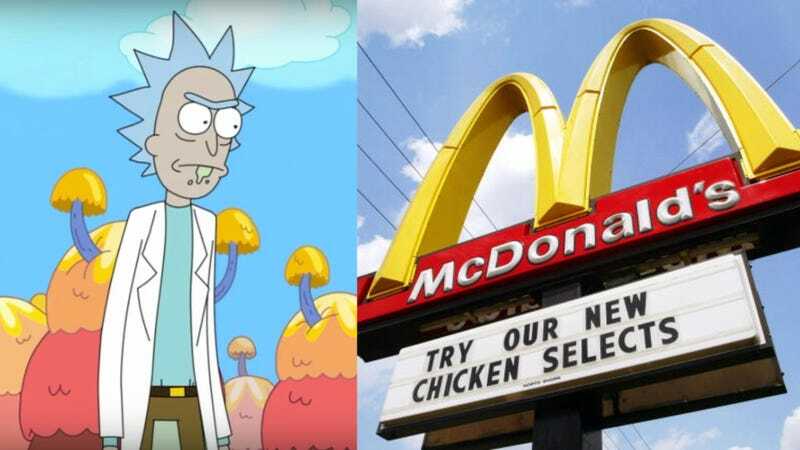 After Rick mentioned his love for Szechuan sauce in a Rick And Morty episode last year, McDonald’s good-naturedly brought back the sauce for a single day in October. That day ended up in chaos, as supplies quickly ran out, and customers got angry until waiting in really long lines. Over Szechuan sauce. Now the sauce returns with 20 millions cups today, which hopefully will hold people over for a few hours. It also arrives with a podcast about the “Szechuan saga,” called “The Sauce” with Studio@Gizmodo and Onion Labs. We might be inclined to head out at lunch today and see what all the fuss is about. Plus, we hear that we can trade the sauce packets for a car or something later.